The terrace is shared by the other two apartments in the Palace, reached by elevator to the third floor and views out over the Grand Canal. 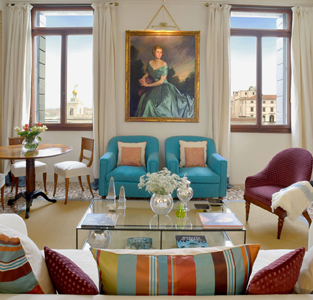 Elevator, Air Conditioning, Central Heat, Concierge on site - The owner's private secretary is available to assist you anything you need during your stay, including reservations at museums and restaurants, offering a Venetian view on this beautiful city. Welcome basket of Bellnii, water and fresh fruit, black tea, nespresso coffee capsules, fresh milk, white and brown sugar, sweetener, butter, jam, sliced bread, salt , pepper olive oil and vinegar. Every morning fresh croissants will be delivered to your door.